As Tuscaloosa Rebuilds, Exodus Of Immigrants Makes Job Harder : The Two-Way A new law aimed at illegal immigrants goes into effect in the state in September, and many are already leaving the state. Construction firms will find it harder to fill the many rebuilding and cleanup jobs they'll have open. 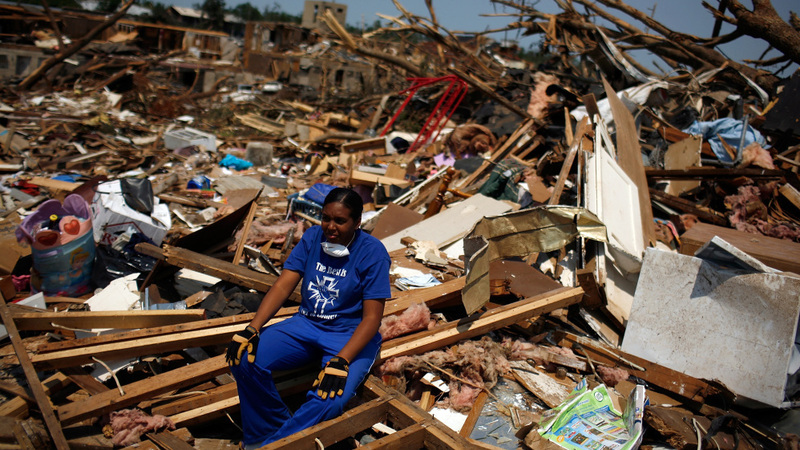 April 30, 2011: In Tuscaloosa, Ala., LaTia Cobbs sat in the rubble of her destroyed home following the massive tornado that swept through the city three days earlier. "When the city of Tuscaloosa, Ala., begins rebuilding more than 5,300 homes and businesses damaged or destroyed by an Apr. 27 tornado, it may find itself missing many of the people it needs to put the city together again," Bloomberg Businessweek reports. The reason: "Tuscaloosa County's 6,000-strong Hispanic population — including roofers, drywallers, framers, landscapers, and laborers — is disappearing in anticipation of a new law aimed at ridding the state of illegal immigrants, which takes effect in September." Local contractor Rich Cooper, though, tells Businessweek that "there are plenty of people capable of working, if they'd just get off their butts and do it." And there will be lots of construction jobs. The Center for Business and Economic Research at the University of Alabama estimates there will be about 51,700 jobs in cleanup and rebuilding — at least in the short-term — related to the tornadoes. It's also common for contractors from other states to come into areas hit hard by natural disasters.